The Geekiest Baby Halloween Costumes from All Over the Internet! There is nothing more adorable than a baby in a costume. Nothing whatsoever. But it's especially great when geeks turn their little offspring into cosplay superstars, shaming the rest of the scabby-kneeded kids on the block. Kneel before Tron Baby, Dobby Babby, Wednesday Baby and BABY Gimli! 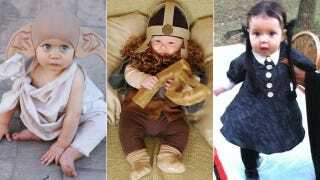 Here they are the best geeky baby costume ideas, for you to steal for your own brood. Made from the hollowed out remains of a REAL Care Bear. That's awesome. Babies with really long hair — love it. By Sean Donohue at Flickr. What is child but a silent object that you project fractured parts of your personality onto? Father And Daughter Baby Chestburster! We love two-person costumes! This amazing creation was dreamed up by Joshua and Catie Pruett. With a few simple modifications, this goldfish costume can easily become an Admiral Ackbar. Goldfish instructions over at Martha Stewart. Via Cute Kids in Costumes. Created by the instructables which also has a play-by-play instruction manual for your own baby/doll/cat/. It might be store bought, but it's still completely adorable. Another fantastic DYI costume form Instructables. And a great way to creep out your babysitter. Created by Sabrina Louise Miller on Craftster, complete with adorable Daddy Doctor! Think you have a cuter costume? Prove it, by posting your photo in the comments.